PanARMENIAN.Net - One person has been stabbed to death on a central Melbourne street where a knife-wielding man was left in a critical condition after being shot by the Australian police, News.com.au says. 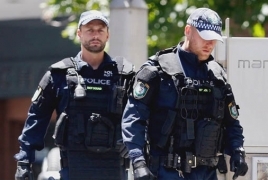 "Three people have been stabbed, unfortunately one is deceased at the scene, two other victims are currently in hospital," police Superintendent David Clayton told reporters at the scene. Footage from the scene shows a man swinging a knife at two uniformed officers near a burning car before he was shot. "At the same time, passers-by were calling out that members of the public had been stabbed. Police shot the male in the chest and he is now in a critical condition under guard in hospital." "There's no known link to terrorism at this stage. We'll keep an open mind as to whether there's any link. It's very early in the stages of the investigation," Supt Clayton said. Hair said two civilians became involved as well as two police, trying to stop the man from his attack. Police want to hear from people who witnessed the event or captured footage as they piece together what happened.